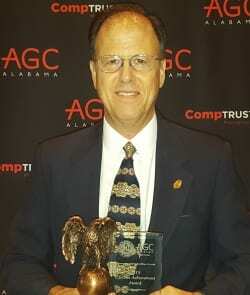 SESI Safety Director honored by AGC Mobile Chapter with a Lifetime Achievement Award - Southern Earth Sciences, Inc. : Southern Earth Sciences, Inc.
SESI Safety Director Don Meyn, COSS was presented with a Safety Lifetime Achievement Award during the Association of General Contractors (AGC) Mobile Section 14th Annual Construction Safety Excellence Awards. This award honors an individual for significant contributions to their company’s safety program and the advancement of safety in the workplace. The local program is an ongoing effort by the Mobile Section, AGC to recognize their members in the Mobile area, who have developed and implemented excellent safety and loss prevention programs through management commitment, employee training and program innovation. Additionally, SEIS garnered a company award for safety under the Geotechnical Engineering category.